by the way, if there is anyone that has sailed on this ship, or someone closely associated with her, i'd really appreciate if you could share a relevant piece of trivia, or an anecdote, with us. A few of us are trying to organise a WW and JR reunion next year for all who had the pleasure of sailing in them or being associated with them in some or other way. We would like to recapture all the old memories – funny stories and naturally, some of the more famous endeavours they have been involved in…before the memory of such beautiful vessels fade as time goes by. That second photo only shows signs of a real working salvage tug…only cosmetic! The steel in her hull was still stronger than what is used today on modern day tugs! See the website http://www.salvagetugs.co.za if you have been involved with the tugs in anyway over the last 35 years. Please add your names to the crew list, contact details and if you have any, photos from the good old days. These vessels are very important part of South African, if not worldwide, Maritime heritage and the memory of them needs to be preserved. Hi Lloyd. Will certainly add my name. Sailed on her and her sister for many years. To my knowledge Bruce, the Smit Amandla (aka 'John Ross') has been awarded a 3 year coastel contract as of this year. I was on the building of wolraad woltemade at robb caledon as an engineer and was on sea trials fantastic ship sad to see her scrapped lying on her side. 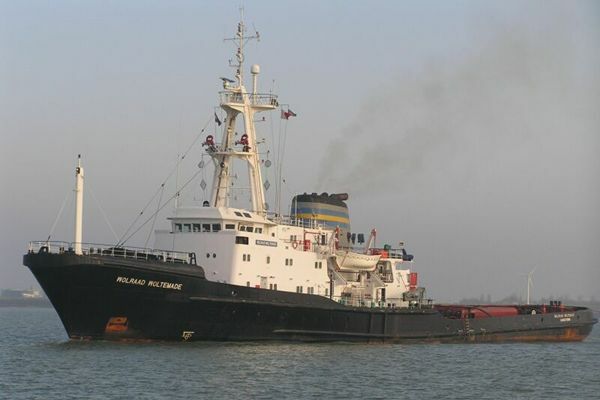 Hi, I sailed on both these vessels and was last on the WW in 2007, sorry to see WW go to scrap, is any of the regulars still working for Smit on the Amandla. Would be interested to know who is still around. Dear all, it's sad for me to hear that the WW is being scrapped.i had the pleasure of seeing this pressius vessel moored at Scharloo (Salazar Kade) in Curacao (Neth. Antilles) at a Smit International terminal, where i work at the same pier for the Curacao Towage Company, a lokal tug company in Curacao. The WW was ondergoing some repairs, and a college went aboard and was told and showed the repairs. The main engenes were beeing overhauled, and the vessel was equiped with every spareparts, and repaires were beeing done conpletely by the crew it self. Unfortunetly i never went aboard,'cause i thouth there will be plenty of time to do that. My college told me, that he never could imagine from the outside how the vessel looked from the inside ! He was impressed and astound by it's beauty and it's tidyness. Wilbur Smith wrote “Hungary As The Sea” based upon the John Ross and I presume WW. I’m a writer and do maritime film production in the United States, and in the early 1980’s was writing the screenplay for Hungary As The Sea, and had a chance to go aboard the JR in Cape Town. Incredible ship and fantastic crew. Very sad to read about WW. If you do have a reunion, let me know. If I can make it, I’ll be there. You might also advise Mr. Wilbur Smith as I believe he still lives in Cape Town. She was one of my fav ships and i remember good times working on her as an apprentice Loftsman, to keep the memory of WW and all the ships built in the Leith Shipyards i now have a website listing them and would welcome stories and photographs, have to add that i have still to get to this incredible ship as the list is pretty long. 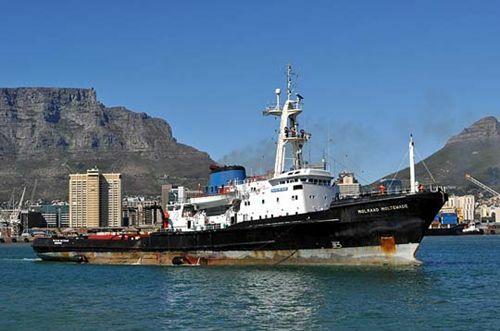 It is with great sadness that I read about the end of the beautiful tug, Wolraad Woltemade. My Father, Captain Robert Jones was captain aboard both the W.W. and the John Ross during the eighties and early nineties and travelled all around the world on them. It is very ironic that my father passed away the same year that the W.W. was finally scrapped and I know that he would have broken his heart if he had known of her scrapping. I hope the John Ross still has a few years to go yet and I know that my father would wish all their crews a long and happy future. thank you so much for your comment Huw, and everybody else. it has been warming to see the responses i’ve received. from all accounts she was much loved by all who sailed in her, and it really saddens me that no solution could be found to keep her afloat. I ALONG WITH GARY ROWBOTHAM AND RONNIE BICKERTON WORKED ON BOTH SHIPS IN 1979 REPRESENTING MIRRLEES BLACKSTONE. I REMEMBER SOME OF THE CREW MEMBERS AT THAT TIME JIMMY HAY, ALEX SMALL, BRUCE, THE GROWLER, DENNIS THE ELECTRICIAN , MIKE SMALLBURGER. HAD A WONDERFUL TIME. I sailed for several years (late ’70’s early ’80’s as Chief Eng on both the tugs. I remember Nigel Hudson and Co carrying out mods on the JR. They had the Stbd Engine in 50 million pieces when we got a called out to do a LOF on the tanker Alcazar which had lost its rudder off Cape Point in the middle of the night in a force 8 (of course). I asked Nigel if he would mind sailing with us in case we had to put Stbd engine back together again as they (Mirrlees) had taken it to pieces. Luckly he agreed as in the end we needed to put that engine back together in a hurry and run it for a short period. It was a sucessfull LOF and Nigel survived (he changed complexion several times during the operation). We awarded him Honoury Marine Engineer status. There are many stories to tell about the two tugs. I started out on these boats in 1978 as 4th engineer and spent many years sailing on both vessels. Sometimes good and some times bad. I remember the Pentagon 82 tow where we had high vanadium content in the fuel which resulted in blocked turbocharger nozzle rings and rotors. Eddie Freestone was chief and I was 2nd. Eug was 3rd and Richard Beeming 4th. Neville was the lecky. Jimmy relived me in Cape Town when we eventually got back. I did a 6 month trip that time. Wasn’t nice. All welcome as is photo’s and or stories, keeping the ship and her history alive.